Our easy-to-use living trust forms are ready for you to customize and print out quickly and easily after completing them. A revocable living trust is a document that works like a will. However, unlike a will, it does not have to go through probate court. 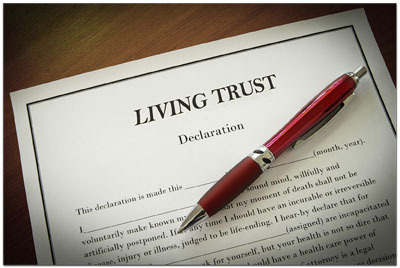 A trust is used to manage real estate, personal belongings, pets, collectibles and other assets while you are alive. In addition, it can provide income for the Grantor (The person who created the trust). You can change a the trust any time you wish while you are alive. Your living trust will contain your assets while you are still living. After death, your assets will be transferred to your heirs without having to through the expense and time of having a will processed through probate court. A past Wall Street Journal article stated: "The advantages of revocable living trusts over wills are substantial. The process is faster, far less expensive, and totally private as opposed to processing and settling a will." The Advantages of Our Free Revocable Living Trust. Everyone should consider using a revocable living trust as part of their estate planning. These independent living trusts can be designed and used to solve the financial goals of everyone involved. For those of you who have large or complicated estate e.g., you own a business, have significant investments, or own numerous properties, high lifer insurance policies, should consider getting the advice of an experience CPA and attorney before using our revocable living trust. Unlike a revocable living trust, an irrevocable trust cannot be ended without the approval of the beneficiary. By transferring all assets into the trust the grantor gives up all their rights of ownership to the trust including the assets it contains. Generally speaking, an irrevocable trust is setup for tax purposes, more specifically, to reduce the tax liability of the grantor. Also, any income produced from the assets of an irrevocable trust will not be taxed. However, because tax laws change and can vary from state to state, you should check with a good Certified Public Account or financial planner before creating this type of trust.